Forget What Did: Peppy and Sterne, Private Investigators. Peppy and Sterne, Private Investigators. You know I said a while ago I might start posting drawings from time to time? Well then, that explains this, doesn't it. They're not pictures of anyone in particular, but they are inspired by the stars of the film I was watching when I drew it. I will be astonished and impressed if anyone can identify that film. It would difficult enough if I had actually drawn the stars of it, and I haven't. And I don't see how Google can help you. I reckon it's impossible to get it unless you happen to have seen it in the last couple of weeks. At the risk of being ostracized by people on the internet whom I've never met, I'm going to go with "Maggie Gyllenhaal and Heath Ledger" (and I've likely skewered poor Maggie's last name as well). Brad Pitt and Julia Roberts in 'The Mexican'. Can't see who else it might be. Hmm. You've labeled it 'fifties couple', is that a clue? Cause it's in no-way helpful. Neither of those, I'm afraid, no. And 'fifties couple' is a terrible clue, because the film was made in the forties. Is it Leslie Banks and Thora Hird of 'Went the Day Well'? Even though I fully realise she's a quickly sketched black and white pen drawing, and from the 1940s, I still have to report that I most definitely would. Men - aren't we pathetic! Hmmmm ...tricky, John. Turns out from checking the IMDB that there's quite a lot of actors and actresses - who would have thought? I'm going for Barbara Stanwyck, as the drawn character depicts that generic Stanwyckesque look that so defined the era of 40s film noir. Right, must return to the soul crushing ennui of pointlessly inputting figures into a spreadhseet for no apparent reason for another 7 hours. The guy who I had to present the completed figures to each day was made redundant in a cost cutting purge last month, so I'm just putting them into a draw now. Maybe I should say something? Still, I'm being proactive and have planned for the future: I've located an empty cupboard that I can use once the draw's full. 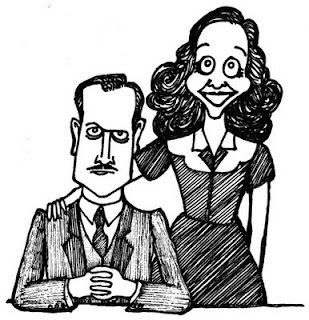 I'll guess William Powell and ... umm .. Irene Dunn? That would make it Life with Father, I suppose. I have little confidence I am correct. Perfect character sketch in three words.